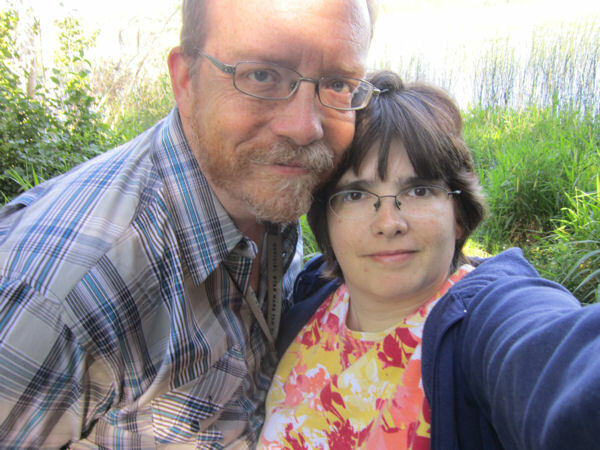 2014 Road Trip Photos #20: Monkey Donuts and the Rest Stop Lake « Midlife Crisis Crossover! My wife and I awoke on Day Five in St. Paul a little grateful that our lodgers did not offer the sort of free continental morning snacks we’re used to seeing in our hotels every year. Being deprived of this standard money-saving amenity forced us to hunt for breakfast options in our surroundings, preferably on the imaginative side. 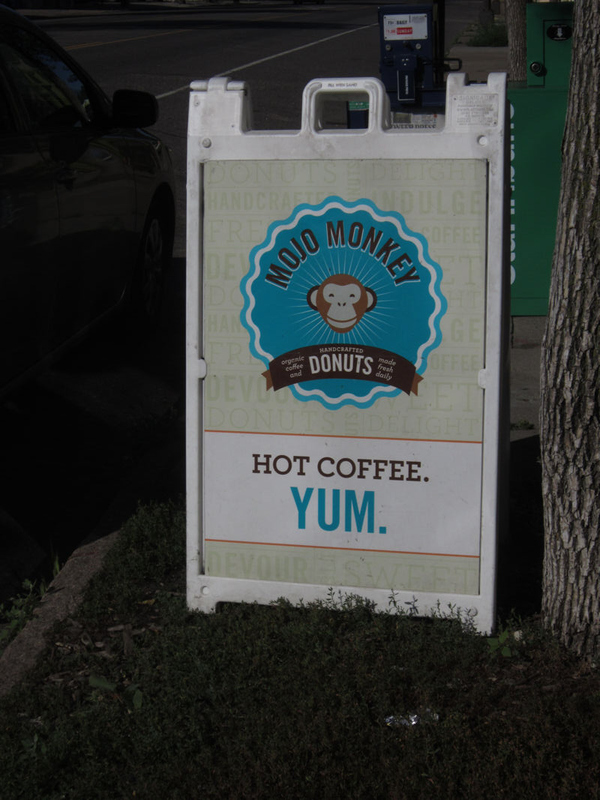 Enter: Mojo Monkey Donuts, a li’l specialty shop that was a few miles out of our way. Their site led me to fix my navigation and put it in our way. Opened in 2011, Mojo Monkey is independently owned and has just the one location. You should go drive there now. 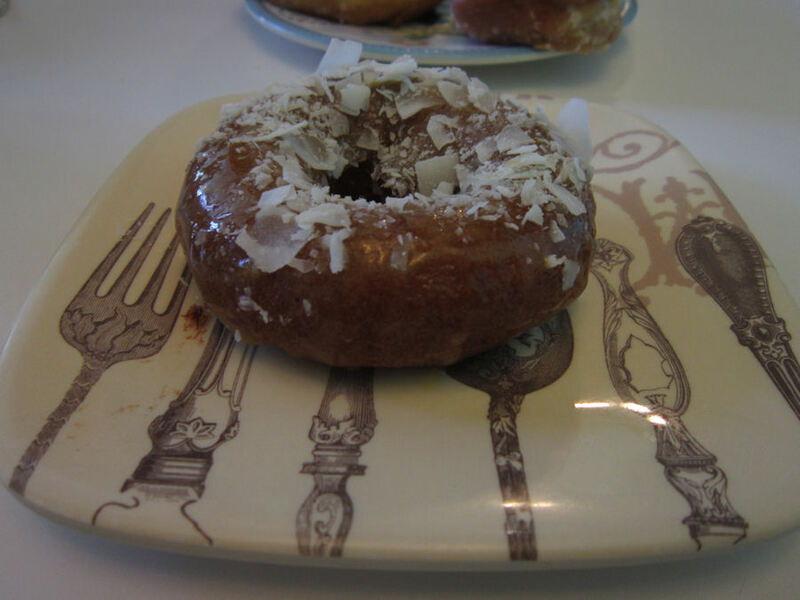 Their sticky, fruity Mango Coconut Glaze. Even their plates are charming. My wife went with the Raspberry Brie. Not pictured: her side order of donut holes. Mojo Monkey isn’t a large eatery, so I wouldn’t recommend bringing thirty of your closest friends there for a foodie field trip until you first explain to them that everyone will have to line up single-file and wait their turn to enter. Whether they take turns peaceably or through combat trials is between you and them. Either way I’d say go for it. They also had a few outdoor tables, and their coffee is not the five-dollar artisanal kind, which is fine by my scorecard. Upon the conclusion of this unhealthy A-plus experience, we took our leave of the Twin Cities for the time being and headed northwest toward our next state. I rarely mention our rest-stop leg-stretching interludes in these travelogs, but on westbound I-94 around mile marker 177, between Clearwater and St. Cloud we chanced upon a rest stop with a natural attraction larger than expected at the end of a grassy path out back. 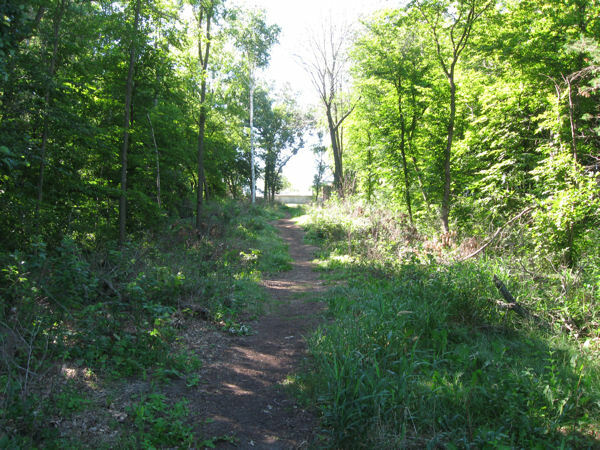 Sure, this trail could’ve led to private property or deadly hunting grounds or living quicksand, but we figured what the heck. 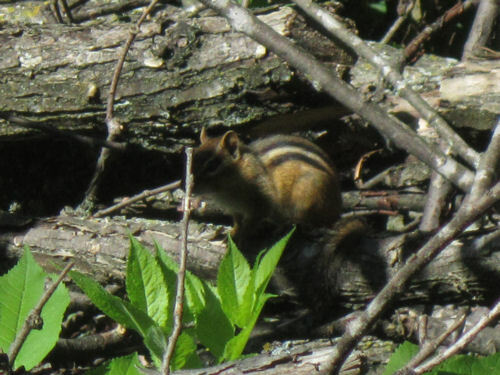 Along the way: surprise chipmunk! The official mascot of this MCC entry. Expect merchandise soon. As of this evening Wikipedia claims Minnesota, the reputed “Land of 10,000 Lakes”, has exactly 11,842 lakes over ten acres. 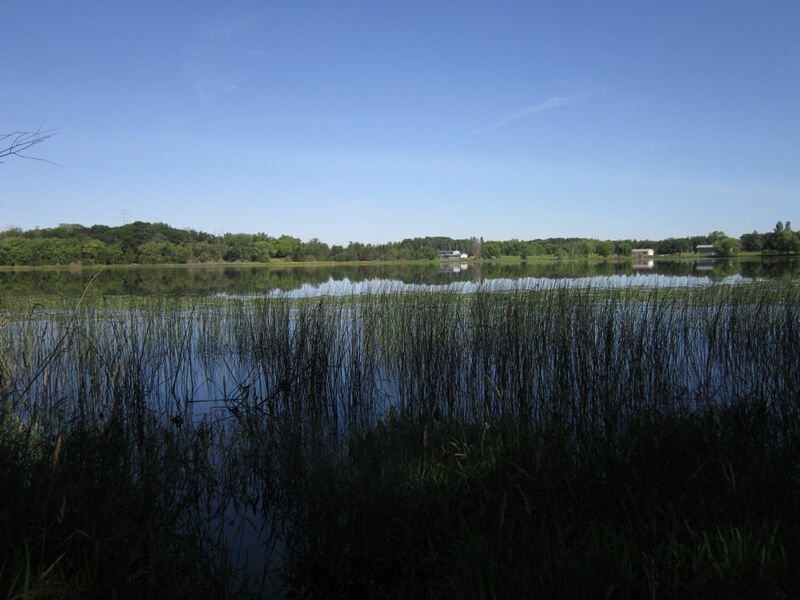 The 54-acre Fuller Lake happens to be the one behind the rest stop. We didn’t bring fishing gear or swimwear with us to the lakeside. We never saw signs encouraging or prohibiting either. Show up and frolic at your own risk, I suppose. When no one else is around and you’d like to have shared moments between the two of you that you can treasure in your golden years…it’s selfie time. Most of our drive out of Minnesota was otherwise unremarkable. 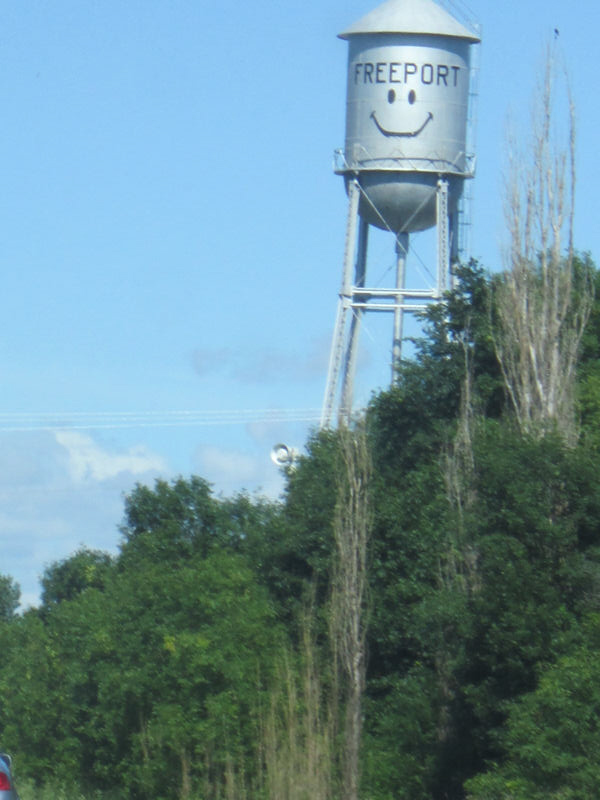 After Fuller Lake won that leg of our journey, second place for Best Thing Along I-94 went to this tall, smiling face. Last place went to deeply resented road construction. Roughly four hours after we left those magical donuts, we crossed the Minnesota border at last. It wouldn’t be the last we’d see of the North Star State this week. 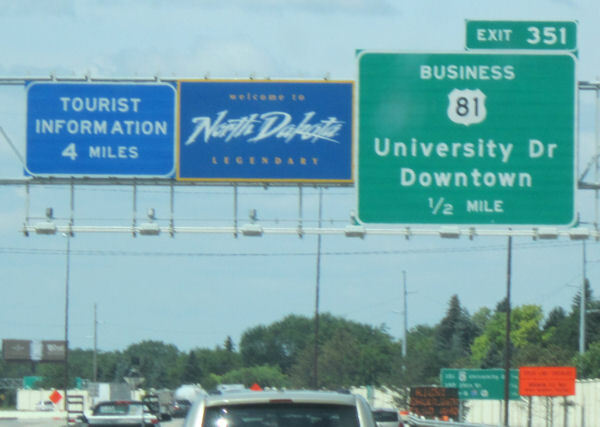 As tourism slogans go, “Legendary North Dakota!” sounds odd to me, but considering that our home state’s current slogan is “Honest-to-Goodness Indiana!” I should probably shut up. 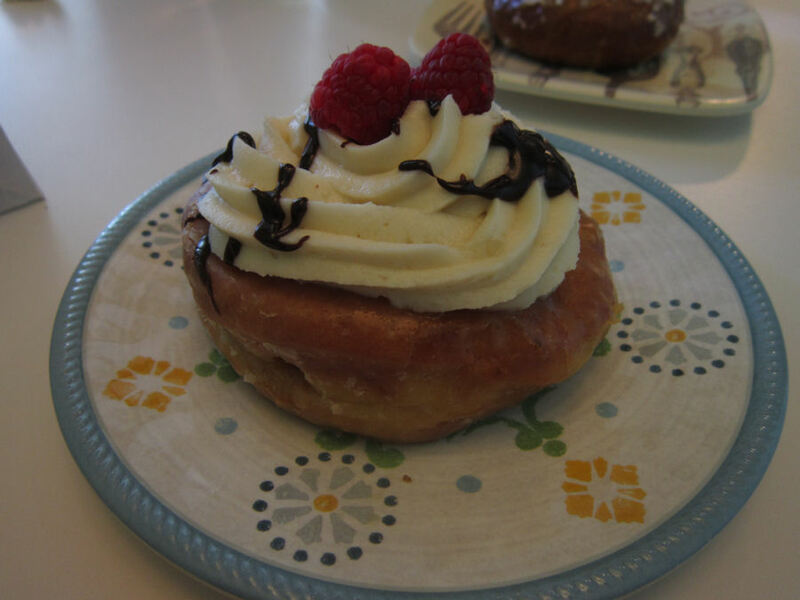 I want the raspberry brie donut! I’m looking this place up. Donuts, pretty lake, happy water tower and a double dose of freckled road trippers, this post is a winner!! Thanks! I wish we’d had room to try six more donut flavors, but this batch was more than filling enough. We could’ve bought more to take with us, but handcrafted art like these deserve to be consumed fresh, not as leftovers. And, following our discussion on your own site, I should state here for the record that MCC takes pride in being a freckle-friendly site, free from the shame of facial profiling. Were these the best testing donuts you’ve ever had or just the most unique while being tasty? Freckles forever! And not too long later I saw a photo of Lorde with the caption beneath “I can’t believe Lorde makes curly hair look that good”. Meh! Someone out there has a problem with curly hair? Wow. That’s just wrong and I don’t get them at all. For hometown donuts there’s a place here called Long’s Bakery that can’t be beat, but they’re one of the old, traditional staples. As of July 2014 craft donuts weren’t yet a thing here, except from a particular food truck that never stops anywhere near me. 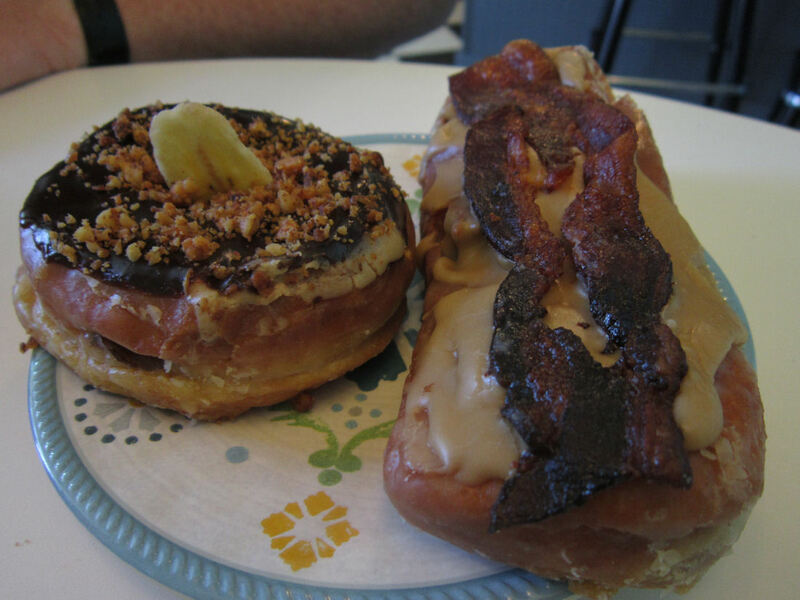 In the past few months we’ve heard about craft donut shops popping up in Indy. Maybe one of them will someday top Mojo Monkey, but I wouldn’t know because they’re all on opposite sides of town from ours. ARGH. Why make such a comment anyway, just say “I like her hair!” and shush. Bah!! I don’t even know if we’ve got a craft donut shop here. We do have Paula’s Donuts and people rave about them. I only tried them for the first time a month ago with a red velvet donut and it was delish. So if you’re ever out near Buffalo that’s what I’d recommend. I’ll have to do some research and see if we’ve got anything that comes close to raspberry brie and if not I will stomp around angrily.